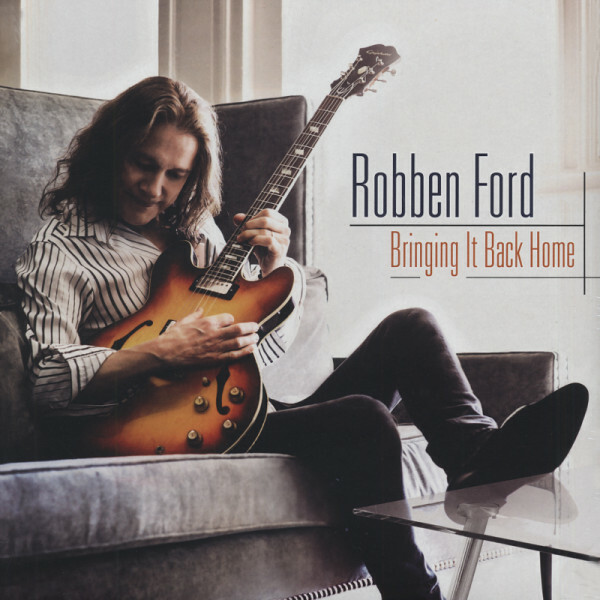 Robben Ford is one of the leading electric guitarists today, especially known for his blues playing, but also at home in a variety of musical genres. Robben is a five-time Grammy nominee. He has worked with artists like Joni Mitchell, Jimmy Witherspoon, Miles Davis, George Harrison, Phil Lesh, Bonnie Raitt, Michael McDonald, Bob Dylan, John Mayall, Greg Allman, John Scofield, Susan Tedeschi, Keb Mo, Larry Carlton, Mavis Staples, Brad Paisley, and many others. Robben Ford was born in 1951 in Woodlake, California, and raised in Ukiah. He was the third of four sons in a musical family. His father Charles was a country and western singer and guitarist before entering the army. Robben began to play the saxophone at age ten and continued to play into his early twenties. Impressed by The Paul Butterfield Blues Band’s guitar players, Michael Bloomfield and Elvin Bishop, he began to teach himself guitar at age thirteen. In the late 1960’s, Ford frequented the Fillmore and Winterland auditoriums in San Francisco to see Jimi Hendrix, Eric Clapton, Cream, Led Zeppelin, Albert King, B.B. King and all of the progenitors of blues. “It was an incredible time for electric guitar,” Robben recalls. On his interest in jazz, Robben says, ”I fell in love with the sax-playing of Paul Desmond and The Dave Brubeck Quartet, and before long found Ornette Coleman, Archie Shepp, Yusef Lateef, Roland Kirk, John Coltrane, Wayne Shorter, and of course, Miles Davis.” These influences have stayed with Robben, playing a large part in his particular blend of jazz and blues that define him as a guitarist and allow him to play in a wide variety of settings. Beatle George Harrison invited Robben to join him on his Dark Horse tour of the U.S. and Canada, raising his musical profile even further. Shortly after the two month stint with Harrison, Robben took a much-needed break from music. In 1977, he was approached by Elektra Records, which produced his first solo recording, ’The Inside Story’, with a group of musicians who went on to become the Yellowjackets. Robben’s 1988 release for Warner Brothers, ’Talk to Your Daughter’, brought his first Grammy nomination (Best Contemporary Blues Recording), and he started touring the world under his own name. Still based in New York, he backed David Sanborn on the television show “Night Music,” on which Sanborn hosted a variety of musical acts. Robben toured with him in 1990, then moved back to southern California shortly thereafter to be closer to his own band. After leaving Warner Brothers, Robben signed with Stretch/GRP Records, where he finally found a real home for his creativity, recording three CDs for them with his band, The Blue Line (Tom Brechtlein on drums and Roscoe Beck on bass). After a very fruitful eight years, Robben disbanded the group and recorded two more CDs for the label which had then become Stretch/Blue Thumb: ’Tiger Walk’, an instrumental recording produced in New York with Keith Richard’s rhythm section, and ’Supernatural’, his most accomplished work up to that point as a songwriter. During that same period, a super group-Jing Chi-came into being, founded by bassist Jimmy Haslip, with drummer Vinnie Colaiuta and Robben. They released three records, the first, self-titled (2001), followed by ’Jing Live’ ( 2003), and ’Jing Chi 3-D’ (2004). In 2007, Robben toured with the legendary guitarist, Larry Carlton, resulting in ’Live in Tokyo’, and an “unplugged” DVD, ’The Paris Concert 2008’. Robben’s fourth release for Concord, ’Soul on Ten’, is a live recording performed in San Francisco (2009). “People had been requesting a live recording for years and I had the right band, music and venue to pull it off.” The record also includes two studio tracks which feature Larry Goldings on B3 organ and John Button on bass. In 2010, Robben and a group of musical friends who have played in different combinations and contexts over the years decided to focus on a project which became the formation of Renegade Creation, with Jimmy Haslip, Gary Novak and Michael Landau. Two records, ’Renegade Creation’ and ’Bullet’, came out of the effort and the group toured widely to much fan appreciation. 2012 found Robben playing internationally with the Miles Davis tribute band, Miles Smiles, featuring past Miles’ alums, Omar Hakim, Darryl Jones, Wallace Roney and Joey DeFrancesco, as well as touring with Bill Evans and Randy Brecker’s group, Soulbop. Provogue Records/Mascot Label Group released ’Bringing It Back Home in February’, 2013, to critical acclaim both in the U.S., Europe and Japan. This album revisits and reshapes Ford’s musical roots, with studio accompaniment from Harvey Mason, Larry Goldings, David Piltch and Stephen Baxter. In March, 2014, Provogue released ’A Day In Nashville’, a tour de force of live studio recording, accomplished literally, in just one day in Nashville. Robben’s latest release, ’Into The Sun’, came out in March 2015 and debuted at #2 on the Billboard Blues Chart. It has such guest artists as Warren Haynes, Keb’ Mo, Robert Randolph, ZZ Ward, Sonny Landreth and Tyler Bryant. Robben taped the PBS show ’Infinity Hall Live’ earlier in 2016 as well as appearing at the Grammy Museum for an interview and performance. He continues to tour worldwide. Customer evaluation for "Bringing It Back Home"